A house in south-west London where two Nobel Prize winners lived has become one of the rare properties to receive two official blue plaques. The building, 48 Paultons Square in Chelsea, was home to writer Samuel Beckett in 1934 and physicist Patrick Blackett from 1953 to 1969. The Irish writer lived there for seven months while undergoing psychoanalysis. The plaques will be unveiled by Downton Abbey actress Penelope Wilton and astronomer royal Arnold Wolfendale. Beckett was still looking for literary work when he underwent therapy, paid for by his mother, after his father's death. His first full-length work, the short story collection More Pricks Than Kicks, was published while he was at the Chelsea house. The Waiting for Godot playwright won the Nobel Prize for literature in 1969. Blackett, described on his blue plaque as a physicist and scientific adviser, was known for his revolutionary work in U-boat detection, ground-breaking research into cosmic rays and the discovery, with a colleague, of the positive electron. He was also hailed as one of the heroes of the Battle of the Atlantic. He had already won the Nobel Prize for Physics, in 1948, before he lived at the house. Ronald Hutton, chairman of the English Heritage blue plaque panel, called Blackett and Beckett "giants in their fields" and added: "These two plaques mark their achievements and celebrate their connection to London." 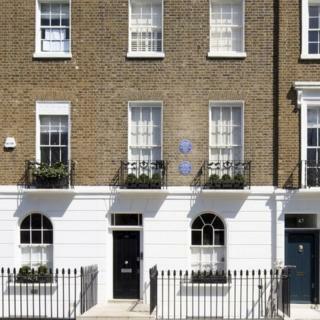 Blue plaques: Do you live in an English Heritage building?